LOL. By the way – I tried it twice and got the same result both times. 🙂 Thanks Bailey!!!! Behind every successful woman there stands…… a group of wonderful, supportive friends. It appears that the Great Tree Saga has drawn to a close. 🙂 The conference will have trees, flowers, bushes and fountains. How? Because I have wonderful friends who have wonderful friends. Chestnut introduced me to Honour, who came up with a plan. I arranged a meeting with Honour, J and myself. Nothing could have happened without Ches and Honour. Had Chestnut not concerned herself with my problems, I would not have met Honour. Nothing could have happened without Honour’s talent, kindness and generosity. I want to thank Bailey as well, who was IM’ing me often, offering support, advice and encouragement. Here is where SL falls short for me. In RL I could figure out some way, albeit insufficient, to thank them all. Some favor or gift, some action I could perform in thanks. But in SL – I know of nothing that I can do. They have all been inworld far longer than I. They know much more than I. I wouldn’t even know how to begin to find gifts for them inworld (LOL – I’d have to IM them and ask for more help! 🙂 ) No way to move my pottery or food inworld. Nor flowers. So the best I can do is to thank each of them personally, here, in my favorite form of expression. Last night was cat night at the benches. 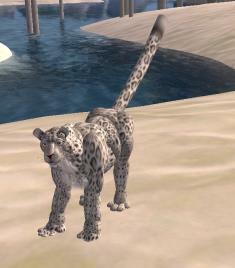 U was showing off her beautiful snow leopard avatar. C decided to get into the act and became a bunny. That may have been a mistake because U growled “Lunch!”. C bravely reached up and rubbed U behind the ears and the peaceable kingdom reigned. 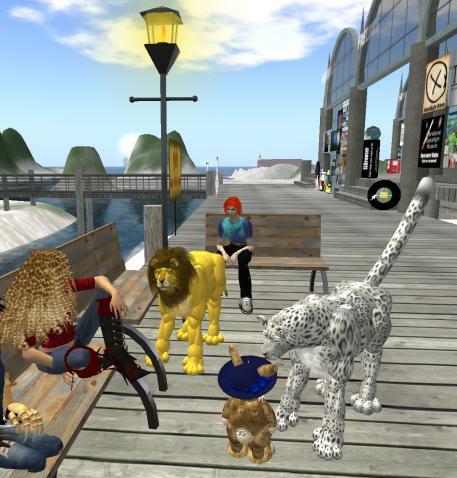 G and U wanted to compare avatars, so next thing we knew, we had G the lion! C definitely began to look like a tasty snack, sandwiched between the two, so she took refuge on a bench. G and U put their avs through their paces – sitting, reclining, roaring and scratching! We were a bit concerned about fleas at that point. 🙂 C slipped from bunny to jellicle cat, waving a fish. 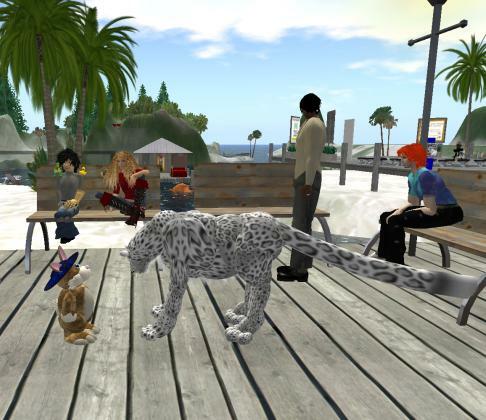 We all relaxed, chatting about nothing much, when U mentioned that these animal avatars can dance. G put up a photo of Lion and panther dancing quite sweetly in each others arms (??? ), on their hind legs. U put on a dance animation. Oh my heavens!!!!! 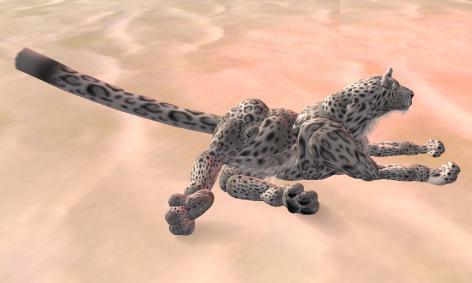 That snow leopard shimmied and wriggled and swayed and boogied! As someone remarked, that image was sooooo wrong on so many levels that it was hilarious. 🙂 Oh for a movie camera! But even if I’d had one – I was laughing way too hard to have been able to film. Cats all over the universe were cringing last night in embarrassment! If that’s how cats dance – I’m skipping the jellicle ball! Hmmm. Maybe this post should be entitled “Sitting”. This fragment is about one of my favorite places to sit. I know I’ve mentioned my friend the cat before. Usually sitting and looking at water soothes my soul. But sometimes I like company. And sometimes when I’m trying on new clothes or putting together and outfit, I appreciate another opinion. LOL. This cat’s fashion sense is not quite as good as my dog’s (My dog is a true devotee of craft shows. 🙂 ) but he is a very comfortable companion. Always happy to cuddle, never a cross word. Or call this “My Favorite Cats”. I was sorting inventory this morning when I got an IM from U. She had a new avatar and wanted to show me. So I hurried over and fell in love!!! What a great avatar!!! Complete with poses and growls and tail lashing! She gets TWO pics because I liked it SO much! After the meeting I stick around. J has said that she will give me some help on how to build and she will show me what kind of trees she would like. Fine. I am a smart, competent woman who has friends who are SL builders. I can deal with this. I login to SL that night, race to the benches, break into the ongoing conversation shrieking “help help I need help!! !” LOL. Okay, that WAS an exaggeration. But it’s an accurate description of what I WANTED to do. Someone asks how I am this fine day and I explain how I have been run over by a bus. My friend S, a builder, tells me that there are lots of trees available for free. I explain that J doesn’t LIKE the free trees. SHE wants STRAYLIGHT-type trees. Everyone on the benches starts googling Straylight and saying “Oh”. They are saying “oh” in the tone of voice that indicates how big this bus is. 🙂 S tells me that she would love to help me but that it takes a lot of time to build a tree, and she really does not have the time right now. I smile bravely, say “No problem” and, like Scarlet, resolve to think about it tomorrow. Tomorrow comes and I begin searching SLexchange for trees. I find several candidates that I think may be suitable. I mark the pages and send them off in an email to J. No point in me buying and modifying them only to have them found wanting. Days (including a weekend) pass. I hear back from J. She likes one of the choices. She likes the privacy hedge. She also suggests yet another pricey SL tree. I can’t even find this one, Chakryn. So I write to the vendor for the hedge, asking for package deals, and asking if I can take a tree out of the hedge and copy it. Less than a day goes by and I hear back. I REALLY like SLexchange – both vendors I’ve contacted have responded quickly. 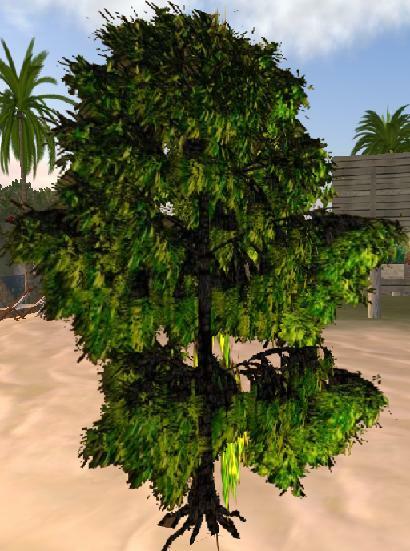 Anyway, he offers me a package deal – 15 different trees for only L$2500 (that’s about $10) and they are all copy/modify. So I tp over to his nursery to take a closer look at these trees. While I’m hanging about there, I get a group message about a Building Basics class about to start in 5 minutes. Karma! I buy a Spruce tree, tuck it into my inventory and tp to class. Class is okay. The BEST thing about it is that it is at the beach classroom at NCI. There is no music playing – only the sounds of the ocean waves and the wind. For an hour as I sat in class, my subconscious processed the beach sounds. All my tensions and stress began to melt away. Ah, there is NOTHING like a day at the beach. Anyway, back to class. It really didn’t teach me anything I hadn’t already picked up from watching tutorial videos online. It was extremely basic and slow. One of the fellow students was having great difficulty doing even the simplest tasks. But once class was over I went up to the teacher, S. I explained my predicament and showed her my newly-purchased tree. Today was yet another planning meeting. J begins the meeting by talking to ME first – telling me that she got my emails and she will requisition $$$ for trees. Ouch. Right out there in the open, for everyone to hear. What I hear, whether or not that’s what J is saying, is that I failed. I am a little frustrated. As YOU all know – I have been trying very hard to come up with trees for this conference. I’ve not been sitting around doing nothing. A little voice in my left ear is saying “Whoopee!!!! We are saved! Give up this tree foolishness!” A little voice in my right ear is muttering “Hey. We can still do this. We have friends helping us and encouraging us. We have made great progress. Who does she think she IS taking away OUR little piece of the project???”. Okay, you already know which voice won. I open my mouth and tell J that I had friends offering to help me and to supply me with trees. That I thought I still would be able to provide trees for this conference. Oh Foolishness, Thy name is Ahuva! 🙂 So J got quite excited at that. I am still on the team. I am now running my own little nursery for the conference. 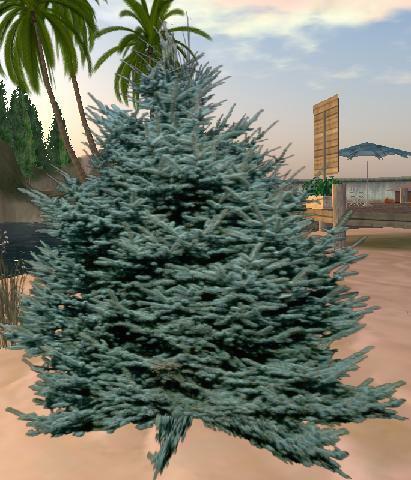 I am to gather up my trees, place them in a corner of our sim, and everyone can come and take what they want and landscape their own sims. LOL. And the other people are STILL complaining about the quality of their (free) trees. Who was the genius who insisted on putting Straylight trees in our sim so that everything else will suffer by comparison???? Calling all copy/transfer trees, bushes and hedges!! Bring me a Shrubbery!!! 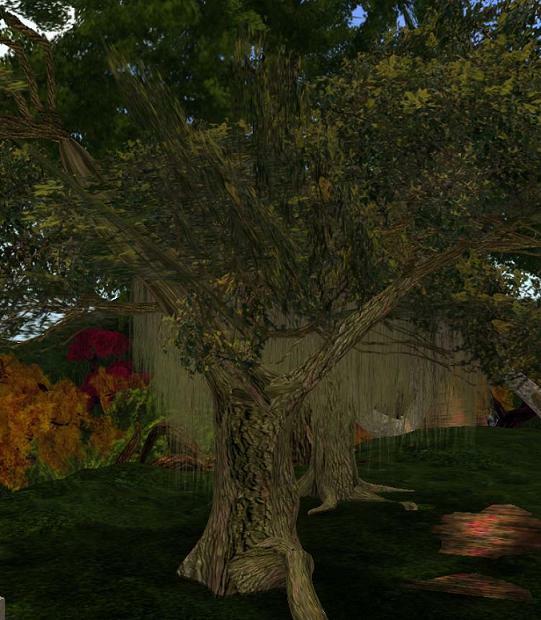 Here’s the “new” mission, should you choose to accept it: I have been charged with taking all “my” trees and setting up shop in our sim, and my cohorts in conferencedom will come and take their own trees for landscaping. LOL. So I no longer have to do the entire landscaping – I merely have to provide trees. That would be Copy/Modify/Transfer. Oh forget that!!! Copy/Transfer!!! Ack!!! Ahuva Heliosense’s Garden Center!!! Bring me a Shrubbery!!! Roflol. Please. Someone. Anyone. Duct tape my mouth shut before the next meeting!!!!!! 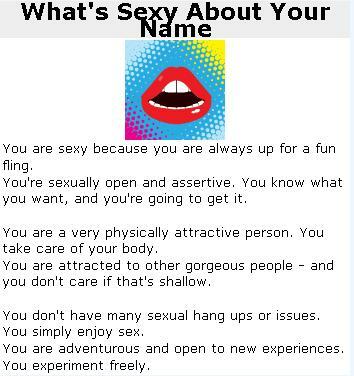 I think I’ve proven by now that sometimes I really don’t know when to keep my mouth shut. You’d think I’d have learned. You’d think that I would have some small sense of self-preservation that would say “Ahuva – don’t, just don’t”. But no. That does not seem to be the case. I committed the cardinal sin the other day. I volunteered. 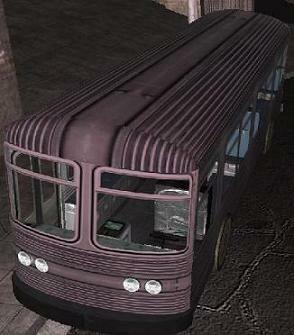 Yep, I threw myself under the uncoming bus,my eyes wide open, believing somehow that I would emerge unscathed. I’d LOVE to blame my co-worker. In fact I tried, but in truth, said co-worker merely encouraged me to play in traffic. I wasn’t pushed. I jumped. I work for a company that does some business in SL. 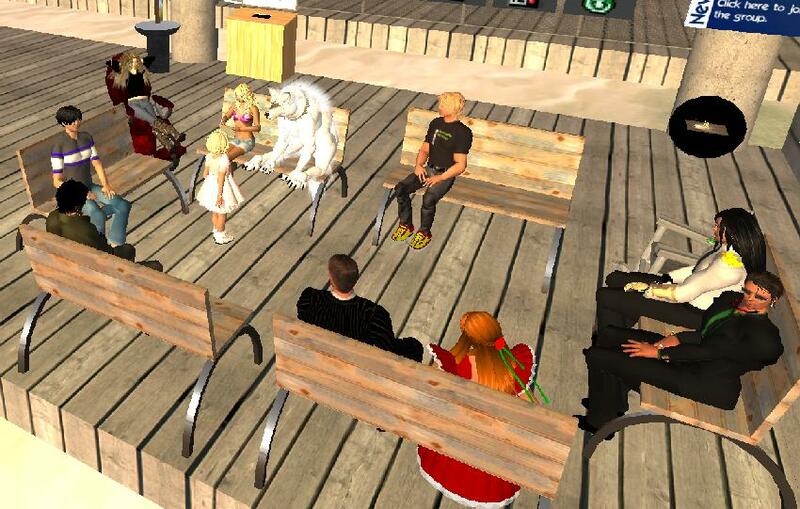 I have joined the SL interest group, I’ve attended some meetings in-world. Now there is a conference being held in-world. I met one of the conference chairs, J, at a party in SL several weeks ago. I expressed an interest in being able to help, as much as a “dumb user” can help. So J suggested that I contact her via email in RL. I did so, and repeated that I was offering my “dumb user” help. Are YOU getting the point here??? Are you understanding the skill set involved???? Gee, I hope someone is. 🙂 Next thing I know I am on the list of mandatory attendees for the set-up meetings. Gulp. Okay, be careful what you ask for (yes – I DO know that is a dangling participle -ignore it). You just may get it. So I begin to attend the weekly hour-long meetings. These meetings have been a real-eye opener, but for reasons NOT related to SL. I’ll merely say it’s fascinating to watch how different groups approach the task of holding a conference. So I bide my time quietly at these meetings. My biggest contribution up to last week was testing someone else’s script. LOL. A woman approached me and asked me to click on her name tag. I was supposed to receive her business card. Didn’t work. 🙂 Can I put “script debugging” on my resume now? 🙂 Then sometime last week J decided that we needed trees to make the conference location look more attractive. Fine, trees are nice, no big deal. Do you see the bus coming over the hill? Thanks WireGuy for fixing this photo for me!! No one is volunteering to be responsible for the trees. That meeting ends. Trees still not assigned. The next meeting occurs. Again the call for trees. Again people volunteer for other tasks but no one wants to plant trees. A co-worker and I are somewhat baffled at the insistence for trees, but what the heck, WE aren’t chairing the conference. Third meeting. Vroom! VROOM!!! Trees. I IM to my coworker and say “What’s the big deal? How hard can it be to find a bunch of trees that are copy/modify and modify them? Do you think I could do that?” Supposed friend and co-worker replies “Sure. Easy. You could do that.” VROOOOM!!! So I say “J, I don’t know too much about building trees but I will give it a try.” SCREEEEEEECH!!!!!!!!!! J says “Thanks, Ahuva! That’s great! !” THUD!!! I am under the bus.